home|work Collective is a group of pro-choice activists engaged in a research and development process on themes of censorship and self-censorship with artist Siobhán Clancy and the Abortion Rights Campaign funded by The Arts Council Artist in the Community Scheme managed by Create (The National Development Agency for Collaborative Arts). home|work refers to domestic policies of the Irish State that affect the reproductive and sexual lives and health of residents. It’s also a nod to the traditional sphere of work by women in Ireland and the practice of making change from within (including within oneself). The Renunciation is one outcome of the process so far. 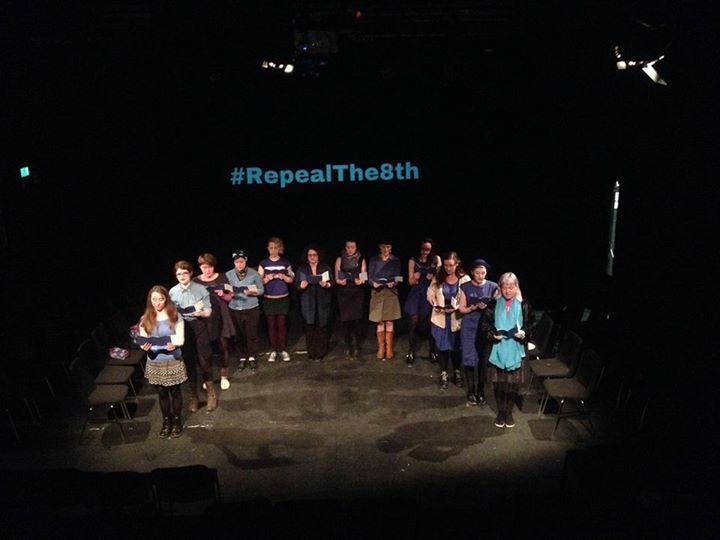 It is a performed reading; an intervention, respectfully, into the reflective space offered by the modern day Angelus with stories that have become rituals for up to 12 people and more daily that have to travel from Ireland to access abortion services abroad or order abortion pills online. The Renunciation was performed as part of an evening of spoken work called “I got the Seanchaí, I got the Secret’ at The Cube in the Project Arts Centre hosted by Vickey Curtis and Úna Mullally as part of The Bram Stoker Festival. It was covered in the IT Women’s Podcast this week.